As promised I hereby return with more Halloween papers - but this time of a slightly different kind. I learned last week that Halloween originates from Scotland! Who would have guessed? 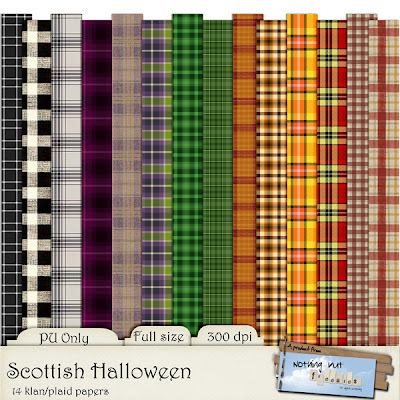 But it inspired me to make today's freebie: A pack of Halloween Tartans = Plaid papers in Halloween colours. I hope you like them and thank the Scottish people every time you use them. We are getting pretty close to the big day now, and I have so much more Halloween stuff to share. That means that I will be posting almost every day in the next week, so come back often or join my site so you don't miss any posts. Thanks for all the neat stuff! These are terrific! thank you so much! Fantastic papers - thank you!